Body length: 160 cm. Wingspan: 310 cm. Plumage: has age dimorphism and slight seasonal differences in the colour of bare skin areas. Adults: during breeding season are white with a pink tinge and black flight-feathers, the throat sac is yellow, the legs - red, while brownish in other seasons. 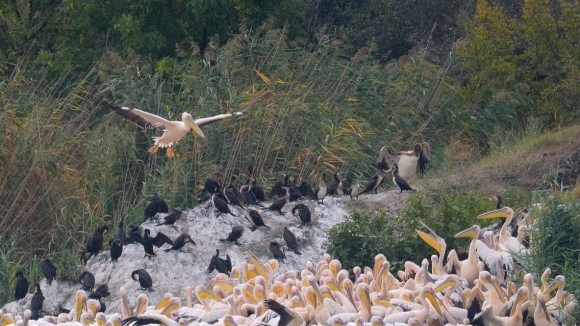 Juveniles are dark brown, which distinguishes them from the juveniles of the Dalmatian pelican. In flight the adults can be distinguished from the Dalmatian pelican by the black-and-white underparts of the wings and the large bare skin patch around the eyes. Voice: at nesting colonies – deep prolonged grunting. Biotope: vast swamps and lakes with reed beds. During migration and wintering at diverse wetland areas and seashores. Migrates in big arch-shaped flocks.